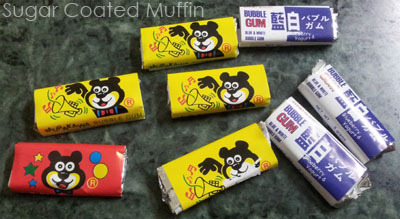 Nicole & I were talking about 'the old days' (swt.. sound so old now) when I was suddenly reminded of a certain bubblegum.. I wanted to blow the biggest bubble in the world so I chewed a few packets together. Chew chew chew... And suddenly I started choking on the huge sticky lump that refused to budge. I couldn't breath and my eyes were teary. Don't know why stupid 7 year old me didn't ask my brother for help even though he was just a meter away. When I thought I was going to die, the gum somehow dislodged itself and I never ate that gum again..
Actually I have a bad case of sweet tooth. Back in primary school, I would go to the Indian shop next door after breakfast (during holidays / weekends) and raid his sweets. I actually went back to the same place to buy the gums above and the wife was smiling at me, probably laughing at how the both of us looked like kids in a candy store =_="